My shipment of new blanks showed up! It’s a bulky washable merino wool, and it’s made in the USA! I’m super excited! The new company I’m ordering from is also supplying the wool/yarn for the 2014 USA Winter Olympic team! How cool is that?! There’s also a sampling of some merino wool which I will hopefully be adding to my Etsy shop as well. I’m going to start dying it up ASAP (with dye made in the USA as well! ), as I will probably make a few quick Christmas gifts with it. I’m also finally on Instagram! 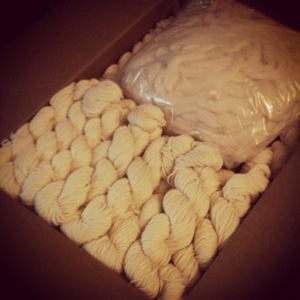 Follow LazerSheepYarns for lots of yarny goodness! What’s on your last-minute holiday knitting list this year?